While local governments may consider themselves fair and just, people of color fare worse than their white counterparts in every area: housing, employment, education, justice, and health. Current day disparities are just as bad and sometimes worse than they were before the Civil Rights era. Since then, most governments have not made significant changes in outcomes for employees or residents of color, even with years of effort. Because local governments have a unique responsibility to all residents, these racial inequities can and must be addressed. The public sector must be for the public good; current racial inequities are destructive. We must go beyond individual, intentional discrimination or acts of bigotry, and examine the systems in which we all live. We must investigate—honestly—how our longstanding systems, policies, and practices, unintentionally or not, have created and continue to maintain racial inequity, and we must change them. Racial Equity Action Plans can put a theory of change into action to achieve a collective vision of racial equity. Plans can drive institutional and structural change. However, the goal we seek is not a plan. The goal is institutional and structural change, which requires resources to implement: time, money, skills, and effort. It requires local governments’ will and expertise to change our policies, the way we do business, our habits, and cultures. Our theory of change requires normalizing conversations about race, making sure we have a shared understanding of commonly held definitions of implicit bias and institutional and structural racism. Normalizing and prioritizing our efforts creates greater urgency and allows change to take place more expeditiously. We must also operationalize racial equity, integrating racial equity into our routine decision-making processes, often via use of a Racial Equity Tool and development and implementation of measurable actions. Operationalizing a vision for racial equity means implementation of new tools for decision-making, measurement, and accountability. We also organize, both inside our institutions and in partnership with others, to effect change together. Organizing involves building staff and organizational capacity through training for new skills and competencies while also building internal infrastructure to advance racial equity. 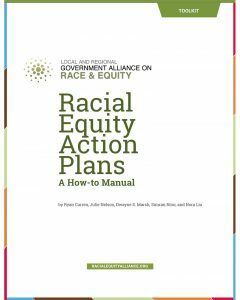 This manual provides guidance for local governments to develop their own Racial Equity Action Plans after a period of research and information gathering. This manual also provides guidance and tools to conduct this research. GARE created a Racial Equity Action Plan template after a national scan of promising practices from cities and counties that have developed plans for racial equity and the structures that supported successful planning processes. We are also appreciative of the Results Based Accountability framework as a disciplined way of thinking and taking action that communities and government can use to achieve meaningful improvements, eliminate racial inequities and lift up outcomes for all. Racial Equity Plans are both a process and a product. A successful process will build staff capacity which can be valuable during implementation. A process can also serve to familiarize more staff with the jurisdiction’s racial equity vision and its theory of change.